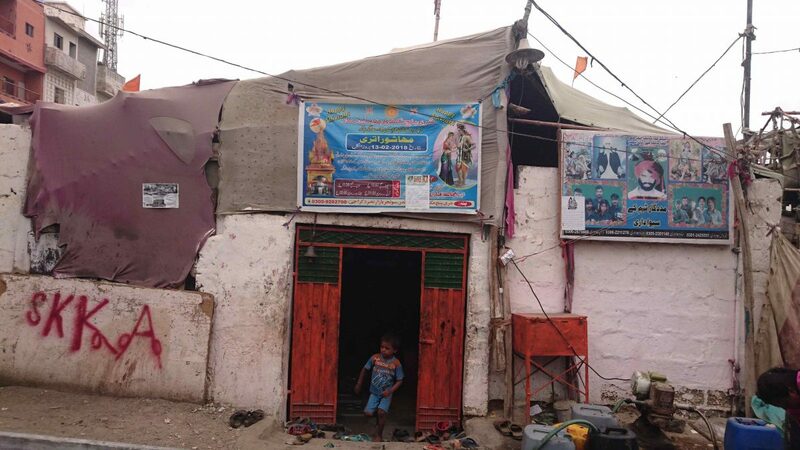 In Pakistan’s Rehman colony, which has neither a public school nor an empty plot, the local Hindu community offered to set up the school at their temple. A brightly smiling Anum Agha adjusts her headscarf and shakes hands with every student. Her soft “Assalamu Alaikum” is answered with a loud “Jai Shri Ram”. Every day starts the same way at this school set up inside a Hindu temple, the boundary walls of which support a roof riddled with holes. Where they are not covered up, you can glimpse the sky. Up until last year Anum, a Naat Khwan, had never even thought about setting foot inside a worship place of a minority community, let alone visiting the temple every day. When she was offered the opportunity to teach Hindu children from scheduled caste families in Jamshed Town’s Rehman Colony back in March 2017, she could not refuse. “Being a Muslim teacher it’s an honour for me that the Hindu community has allowed me to teach their children,” she said. The school was set up at the temple by the Initiator Human Development Foundation (IHDF), a nonprofit that provides education and support to disadvantaged children. The local Hindu community, which has neither a public school nor an empty plot in their shanty town, offered the organisation to set up the school at their worship place. Last year the Muslim teachers and their Hindu students celebrated Holi, Raksha Bandhan, Diwali and other festivals at the school together. “Religious differences can’t be eliminated until we accept one other,” said Anum. Kawal Ram, 29, said Rehman Colony’s Hindu community is delighted that Muslims are taking an interest in teaching their children. He recalled that in 2015 a mob led by a cleric had set fire to their homes and threatened them to leave the locality. Hotu Ram, 50, said Hindus have been residing in the area for the past four decades. He said their shanty town currently has more than 300 children, so the government should establish a separate school for them. The parents sometimes do not wish to send their children to school because most of them help earn for their families through begging, collecting scraps and selling a variety of things mostly during school hours. So Anum consulted with IHDF President Rana Asif Habib to run the school in two shifts. Girls attend classes in the morning, while boys come to the school in the evening. However, the teacher does not restrict them to shifts, so they could study here whenever they are free. Even though the school has been set up on the Hindu community’s doorstep, seasonal migration and diseases impede the children’s studies. IHDF community mobiliser Kamran Ahmed said the locals move to interior Sindh in the summer and return in the winter. Even though Rehman Colony boasts Karachi’s biggest notebook and furniture markets, the temple school has no furniture and its students have no notebooks. 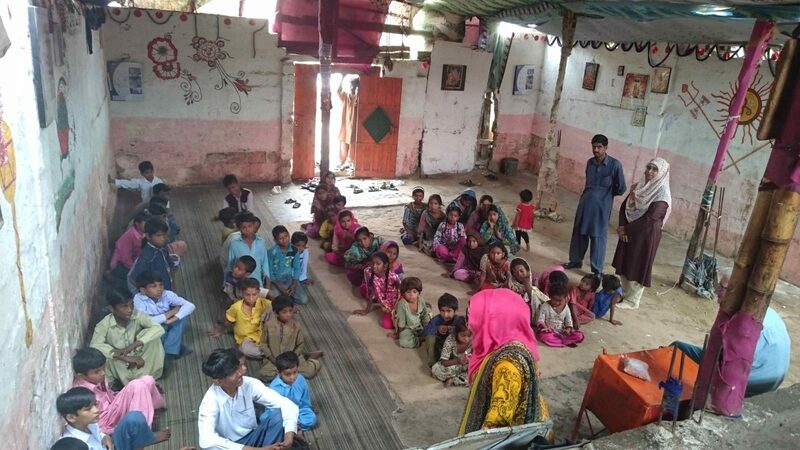 “The teachers have repeatedly requested business persons to donate furniture and rejected notebooks to these children but to no avail,” said Rana Habib. He said a private university is located near the temple school. “If their faculty were to help these children, they could get access to formal education,” he added. He lamented that the provincial and federal governments have not devised any policy for the education of street children. 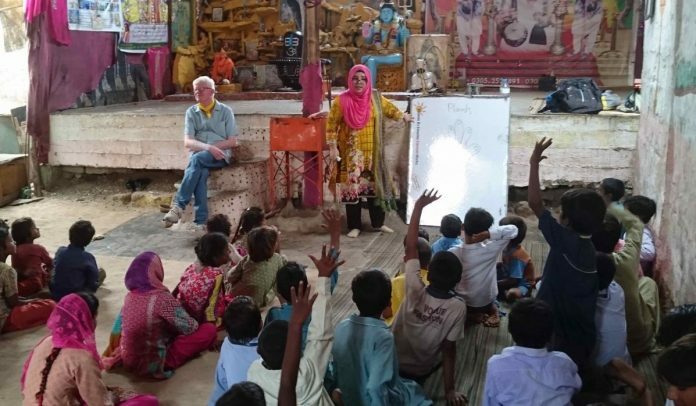 IHDF psychologist Hira Saeed said the street children’s skills could be honed to help them achieve results that are better than those of the kids who live with their families and have access to plenty of facilities. Right now 93 Hindu children are studying at the temple school, while more than 100 of them have already been made part of the formal education system. Anum teaches her students the basic courses, upon whose completion the children are enrolled at government schools. In the past year she has enrolled 100 students in Rehman Colony’s Government DMC School. She visits her former students there every month to check their performance and attendance record. The article was originally published in The News. Read the original article.